The world’s first processor expressly designed to perform secondary analysis of next-generation sequencing data is relieving the bottleneck between sequencing and practical application. Setting a new standard for speedy analysis, the processor recently allowed a provider of clinical sequencing services to analyze sequenced genomes in just 26 minutes. Moreover, it did so while maintaining high sensitivity and specificity, even though conventional analysis normally takes around 30 hours. 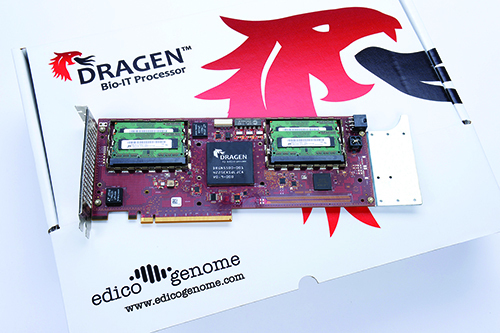 The Dragen™ Bio-IT Processor, developed by Edico Genome, performs reference-based mapping, aligning, sorting, deduplication, and variant calling using optimized algorithms. During the 26-minute-long analysis just mentioned, Dragen processed raw sequence data from a single whole genome, converting the data from base call format (BCL), the sequencing instrument’s native format, to variant call format (VCF) at 30× coverage. By maintaining this level of performance, the processor was able to analyze 50 whole human genomes within 24 hours. Earlier, when the processor was used to enable a record-breaking 26-hour diagnosis of critically ill newborns at Children’s Mercy Kansas City, it exhibited a sensitivity and specificity of 99.5%.